Beginner's Hair Manual: Links To Helpful Posts and Articles – Just Grow Already! I hope this post will be helpful to those just starting out or any one who is looking to brush up on hair ins and outs. I’ve complied links to articles and threads from longhaircareforum.com that have helped me immensely. I will continue to add and update this post when I come across more helpful, informative posts/articles. Reduces the friction between hair strands and silks hair, reducing breakage. Seals in moisture by sealing the cuticle. Correct porosity because clear/colored rinses contain proteins that bind to the hair shaft. Deep Conditioning Deep conditioning is key for maintaining hair’s elasticity, diminishing risk of breakage, and keeping hair soft and moisturized. 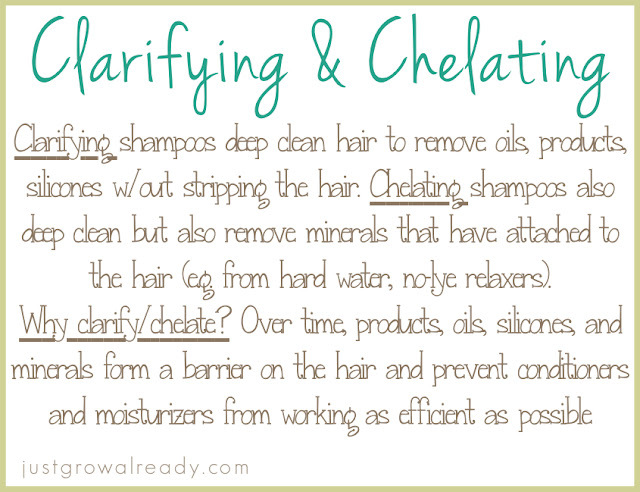 List of a few chelating shampoos with may help. 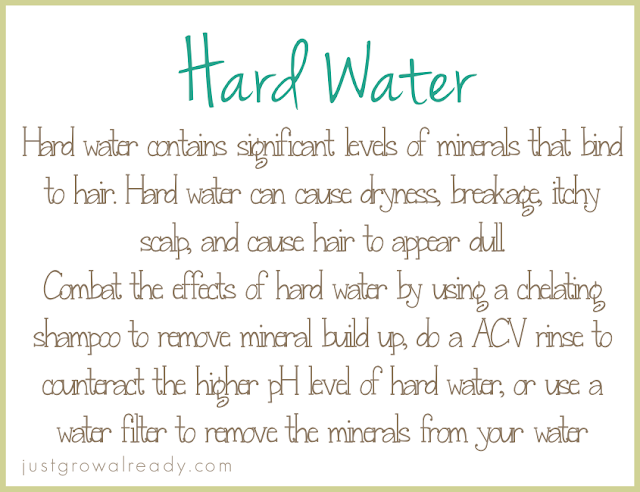 Doing an ACV rinse or using Roux Porosity Control to lower your hair’s pH to counteract the high pH of hard water. What is hard water? Water that contains high levels of minerals. Henna (and cassia) Henna or cassia applications are a great, natural way to stretchen and thicken up your hair. Is Moisturizing and Sealing Important? Protein Our hair is 90% keratin, protein treatments help to stretchen our hair. Relaxed hair especially requires protein treatments from time to time because chemical relaxers break down the protein bonds in our hair. Protein Overload? Let’s Fix It by Hairlicious Inc. Regimen Building Nailing down a no-muss no-fuss regimen that works for you may be a little nerve-wracking, but don’t worry, you will learn just what works for you. Protect your previously relaxed hair by coating it with a conditioner, oil, vaseline, etc. You want to make sure your previously relaxed hair is protected in order to minimize thinning and overprocessing due to relaxer runoff. Thoroughly neutralize the relaxer. Using a color activated neutralizing shampoo works best for this. Irritate your scalp in the week leading up to your relaxer service. Wash your hair within 4 days of your relaxer services. Washing opens the pores of your scalp and may leave you susceptible to burns when you relax. Why use a serum? Serum aid in detangling by providing slip, act as a heat protectant when using direct heat, help smooth hair, and can even seal in leave-in conditioners and moisturizers. How To Get Thicker Hair by Sunshyne of Hairlicious, Inc.
Next Post: Poll: What Type Of Relaxer Do You Use? Hi there. I’m having splits ends and my hair breaks. What do I do. Pls help. Hello Jen, So I just started my hair journey now.. my hair is just neck length so its really difficult to get into a high bun.. im really inspired by your blog!!! one of the myths i believed was that the more you trim the more your hair grows lol… i have a very very very itchy scalp what do you propose i do? Kindly bear in mind that im all the way in Africa, we dont have variety of products like you do lol!!! Hello! I'm starting college soon and started researching proper hair care. I stumbled upon your blog when searching hair regiments for relaxed hair. I have never ever EVER had hair grow past my chin. Ever. I got so frustrated that I stopped using relaxers for five months and used a sew-in as a protective style. I recently relaxed my hair, like two weeks ago, and while it was bone straight and smooth, my hair felt thin. I couldn't run my hand through it without breakage. And to top it all off, My hair was still chin length! I'm at my wits end. My stylist say it growing and that my hair is suppose to be like this, and since I've never self-permed I cant tell if she's doing something wrong. How do I start the hair growth process? I've never self permed and don't know where to start. how long do you wait to wash your hair after newly relaxed hair? After a trip to the salon I don't wash my hair because weeks for several because she straightens it as well and it would seem like a waste. How often do you straighten your hair? How do you maintain it? How do you maintain it after a wash? I'm sorry for the bombardment of questions, but I am so sick of looking at thin, chin-length hair that never grows. I'll be out on my own soon and I want this to change. I've been fallowing the advice of my mother and stylist with no results for years. I just stumbled across your blog today for the first time, but you do a great job. As many people have mentioned this is a very comprehensive array of links and I will slowly begin working through many of them. Take care. Detailed and well researched! Thanks so much! Will be sharing this with other newbies stat! I recently started a blog to document my hair journey. I've decided to go natural in an attempt to recapture a quality of hair that has evaded me for sometime now. I figured going natural would afford me the benefit of being curly or straight. Then I came across your blog. Totally had me thinking for a bit! I think I will still stay on the natural route, but your blog has completely blown me away with the amount of content and knowledge, I don't know where to start. I'm hoping that your entries can help me find a regime that works for me, and getting me back to the healthy hair I once had. I currently have a sew in weave to give my hair a break to grow. Do you have any tips on growing your hair while having a weave? Thanks Jeni! This page is awesome, very informative and so well-organized. I'll definitely be saving it to my webpage 'favorites'. Holy smokes batman! I was wondering why I always had a steady stream of traffic from JGA – this is awesome and so well organized! Hi Jen, I just decided to embark on a healthy hair journey as soon as the new year started. Thank you so much for this website. Everything here is so helpful, you have no idea how many people you are blessing. Thanks! Hi Jen. Just signed up to your site and I love it! I am about to start my relaxed hair journey totally from scratch. I have been doing research for the past week but I am still unsure about what to do first. Any advice on how to start? Are these hair tips for women with natural hair as well? Thanks so much for putting this page together – I know you did it ages ago but as someone who's just starting out on her hair journey this is incredibly helpful! Just found this blog it is awesome. I've recently re-started my hair growth journey. Couple of questions. How long do you stretch ur relaxer and what relaxer works best for you. I'm still unsure at the relaxer that I currently use and I'm too scared to change it up. I usually get a relaxer every 3 months but I'm trying to push it a bit further. My protective style is a ponytail or bun I do allow my self to wear my hair down at least once a month for a week but that is about it. Thank u for this blog about "relaxed" hair. Everyone seems to be going natural at the moment and I'm not ready so I can appericate this site so much. Again thank you for the inspiration!!! I normally stretch between 10-12 weeks, but I'm currently going for 19 weeks. I've been using ORS Relaxer, lye formula, normal stretching for a year I think and I love it because I texlax my hair and it leaves me underprocessed just the way I want. Good luck on your journey! For months, Ive been trying to achieve healthy hair and BSL but nothing would work! I think this guide will finally put me on the right track! Thank you for posting! OMG this is awesome:) I am natural but this is good info that can be applied to anyone wanting healthy hair. 1. Would you recommend washing with baking soda after relaxer to help neutralize? 2. Is it necessary to wrap your hair at night or can I just make a bun and put on my satin scarf? I ask because I want to decrease manipulation and I cant find a way to wrap my hair without combing and brushing a lot and my hair is too short to do a cross wrap. Can I just make a protective style and put on my scarf? I read that no-lye relaxers leave deposits on your hair (calcium compound). I thought maybe clarifying would help with that. What do you think about using lye vs. no-lye relaxers? Using a chelating shampoo would remove any minerals that a no-lye relaxer leaves on the hair. Are these tips for women with natural hair as well?? Do you have tips or a video about how to dust and/or trim? Thanks. I definitely just opened almost every link in a separate tab 🙂 ! Thanks for this post it is more than helpful!